LUANG PRABANG, Laos - The experience at the Elephant Park Project was amazing. We were part of a 5 person group that headed about 30 minutes outside of the town center to have a day with the elephants. When we arrived at the park our guide explained the conservation efforts of the park, the rules we needed to follow when we were around the elephants and interesting elephant facts. At this park there were 7 females of varying ages. Then we climbed a small tower so that we could get onto the bench-like seat that is on the elephant. Stacy and I both climbed onto Mae Pua along with her mahout (the elephant's keeper for life) and we were off into the jungle. There were parts of the path that were very steep but the elephant handled it gracefully; unlike her passengers!! We soon reached the river and made our way across. As we were going along, our mahout asked if I would like to take the drivers seat. 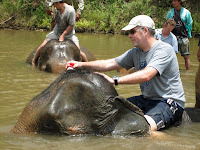 As I climbed down from the safety of the chair onto the elephants neck, I was thinking, "how do you stop this thing." All of a sudden, there I was with my legs tucked behind the elephants ears, sitting on her head & walking through the water.....what a thrill! Soon we came to a sand bar in the middle of river and our mahout took our camera and jumped OFF!!! 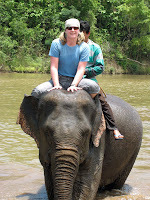 Yes, I was still driving and there was no mahout on-board....he was taking our picture as we were walking along. Stacy took a turn also and chauffeured me around on the elephant. We returned to the station were we had begun our elephant ride. Next we then attended "mahout school" where we learned the different commands & how to get on and off the elephant as a mahout. 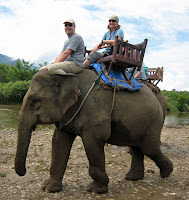 The bench-like chairs were removed from the elephants backs and we each climbed onto our own elephant as a mahout. Stacy's elephant, Mae Cot, is the leader of all the other elephants and the oldest one at the park at 60 years old. 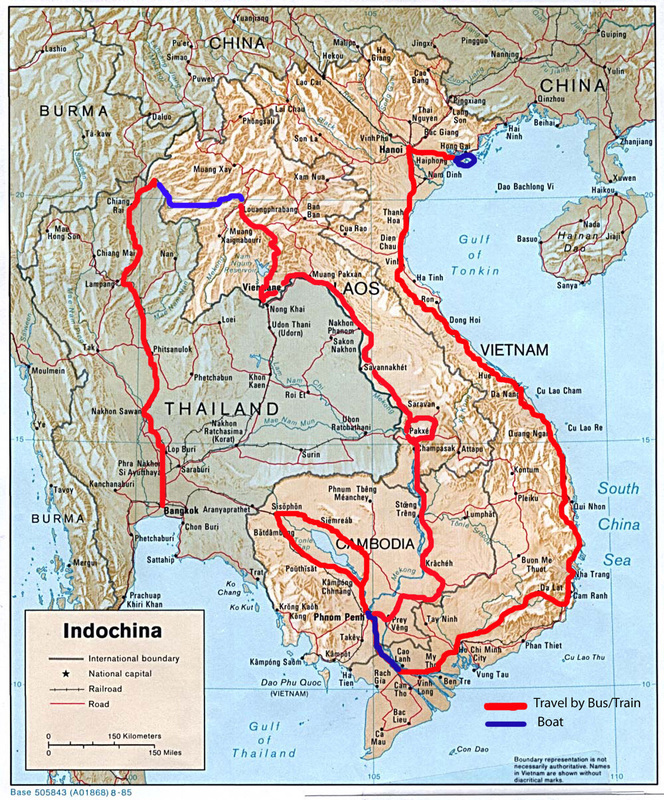 I stayed with Mae Pua as my elephant. She is the youngster of the group at 17. Her mother died when she was 3 and her current mahout quit school to be the one to take care of her. We rode our elephants back to the river for their bath. Once we made it to the middle of the river I saw Stacy with Mae Cot partly submerged and getting a nice bath. As soon as Mae Pua and I reached them Mae Pua completely submerged her entire body into the river and me with her. Mae Cot never did this while Stacy was bathing her but Mae Pua was very playful and decided this was fun....continuing to do this 3 or 4 more times. Even though there was elephant dung floating around a bit, this was still the most amazing experience! You can tell the elephants love to be in the water and be scrubbed with a brush. They are flapping their ears and moving their trunks all around. So much fun!!! We then went to the other side of the river and a short way into the jungle where we said goodbye to our new elephant & mahout friends. Our guide explained that the mahouts will continue taking the elephants up into the mountains to eat and sleep. The remainder of the day we were served a lovely lunch and given massages in huts overlooking the river. The end to a day I will never forget!